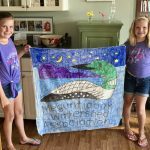 Please join these young artists and many more of the Megunticook Watershed community at our fundraiser at Flatbread Company, July 31st or from 5 PM to 9 PM. A percentage of your dinner will be donated to the Association. To buy raffle tickets for a chance to win an Old Town kayak, courtesy of Maine Sport, contact paul@megunticook.org. See you all there!